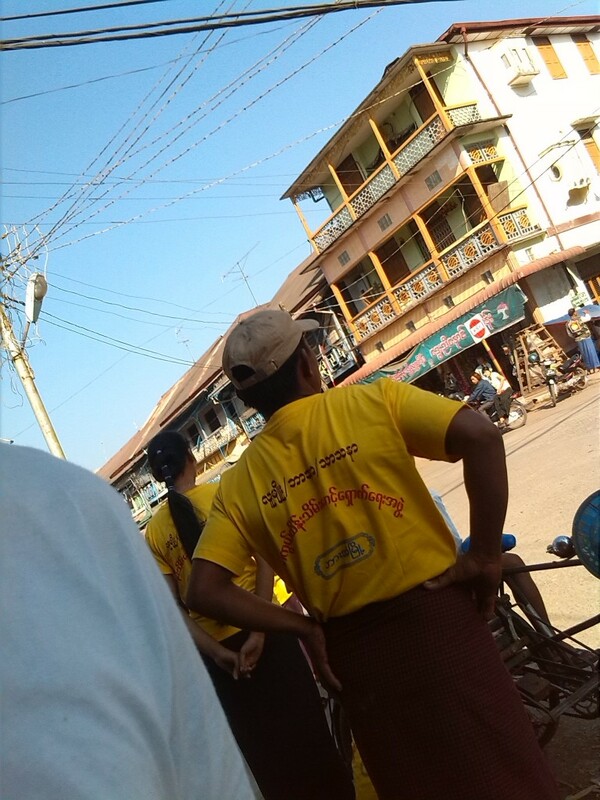 On 20th January 2013, at about 9:15 am, near Myo Ma Market in Pha-ann (Capital of Karen State), young monks and youths wearing T-shirt with the printed Burmese words meaning “Organization for Protecting and safeguarding Race and Religion”, scrutinized the Buddhists who bought goods from Muslim shops and asked them to return the stuffs back to the Muslims. One of the incidents was – when they found a Karen ethnic had bought zinc roofing sheets from a Muslim shop, they threatened him and asked him to return those back to the shop and purchase only from the non-Muslim shop. It was reported that this incident was witnessed by nearby people of different religions. This kind of incident was the first time in Pha Ann city. There was the another group of three youths waiting near Kan Baw Za bank and inspecting who were going to buy from the nearby Muslim shops. It was reported that authority did not take any measure against these hatred movements. Moreover, anti Muslim booklets with the title “You must read it” were distributed recently in Kyaut Kyait and other villages near Pha Ann. The name of the author was not mentioned in this book. A Muslim from Pha-ann told M-Media that wrong facts about Islam and profanity and insults towards Prophet Muhammad were described in this book. Although there were trade deals between Kyaut Kyait village and other nearby villages, after the restrictions Kyaut Kyait villagers had to do business within their own village. The breeding ground for those hate incidents was the resolution made by Karen State All Denominations (Buddhist) Religion Protection and Safeguarding Organization’s meeting on September 10th 2012. 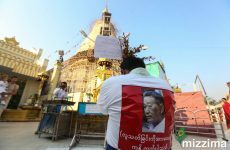 The resolution consists of four restrictions which urge Buddhists to stop dealing with non-Buddhists socially and commercially and not to sell, buy nor rent houses to non-Buddhists. This news wass mentioned on the front page of the Global Post Journal dated October 19th 2012. 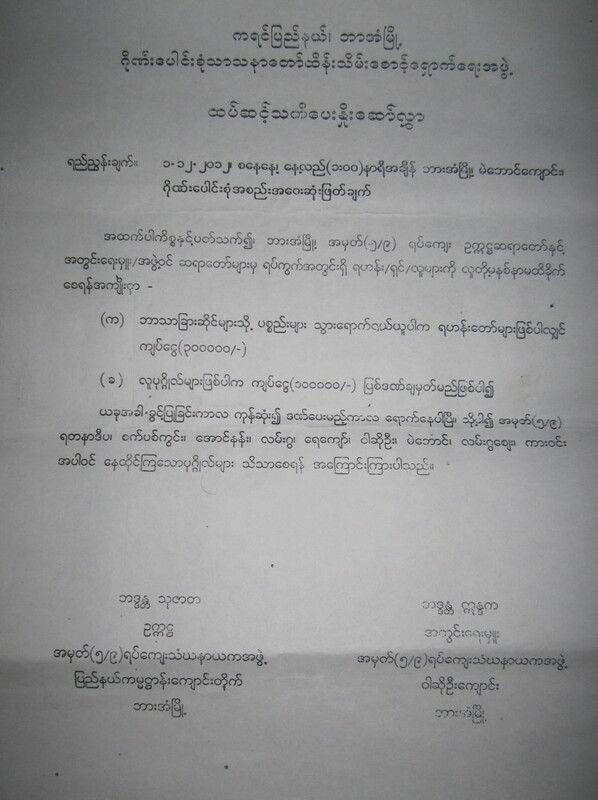 On December 1st 2012, Karen State All Denominations (Buddhist) Religion Protection and Safeguarding Organization met again in Mae Bown monastery, Pha-ann and published and distributed the announcement pamphlets stating that the grace period had ended and there would be penalty for those who failed to follow their resolution. 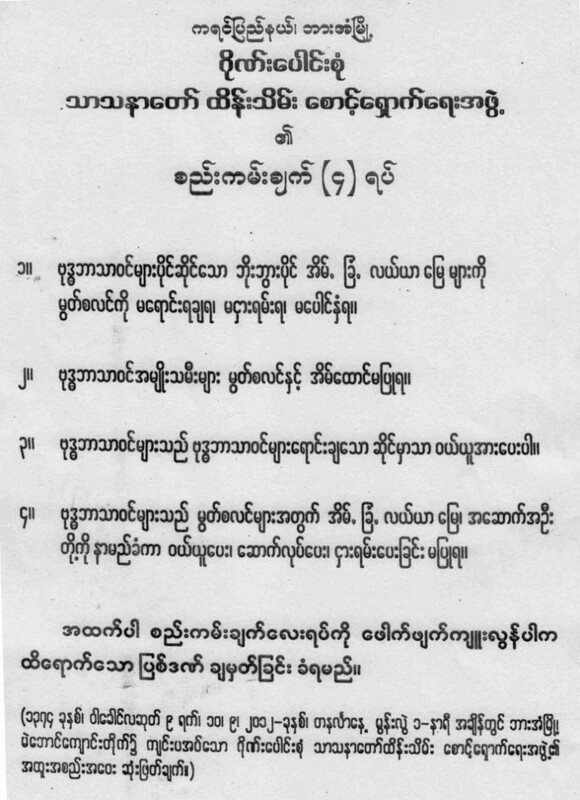 In these pamphlets, it was stated that the monk would be fined 300,000 kyats and the layman 100,000 kyats if they bought any goods from non-Buddhist shops. 3) The Buddhists must buy goods only from Buddhist shops. 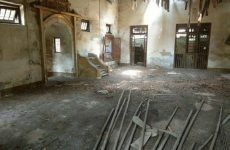 4) The Buddhists must not act as surrogate for Muslims to buy, build nor rent houses, land, farm and any other buildings. Anyone breaches these four restrictions will be punished by penalties. Reference: Resolution of the Pha-ann Mae Bong monastery, All Denomination (Buddhist) Religion meeting on December 1st 2012, Saturday, 1:00 pm. Now, the grace period has ended and the penalty period has started. Therefore, we inform all the people including residents from No. (5/9), Yadana Depa, Sat Pyit Kyon, Aung Nan, Lan Gwa, Yay Kyaw, Wa So Oo, Mae Bong, Lan Gwa Zay, Car Win to be aware of this restrictions and penalty.